From a 17th century English map of China, depicting the area from Khotan (Cotam) to Cathay, with its capital Khānbāliq (Cambalu). In the course of my research, I often come across episodes and anecdotes that I find very striking but difficult to convey in an academic format. Such was the case with the (fake) Zoroastrians of Cathay and Khotan. It was while reading the autobiography of Dasturji M. N. Dhalla that I first came across a reference to the kingdom of Cathay and Khotan. As a student of Oktor Skjærvø, one of the greatest living authorities on ancient Khotan, I have a degree of familiarity with things Khotanese. However, the Khotan that Dhalla described had virtually nothing to do with the Khotan that I was acquainted with. According to Dhalla, a Muslim traveller named Sayyed Husayn had come to Bombay in 1840, claiming to hail from the land of Cathay and Khotan. Sensationally, Sayyed Husayn claimed that his homeland was ruled by a Zoroastrian king named Gushtasp Bahman, and the people there spoke Zand and Pāzand, though they knew a little Turkish too; needless to say, this immediately attracted the attention of a crowd of Parsis. Now, when talking with Parsi friends, I have been told many times, often in hushed tones, that there exist large Zoroastrian communities in addition to the familiar communities in India and Iran – supposed hordes of crypto-Zoroastrians in Tajikistan, the Sāheb-Dilān under Mt. Damavand in Iran, or even Zoroastrians who went to Germany after the fall of the Sasanian Empire. These tall tales echoed in my ears as I read Dhalla's description; I had always imagined that believing in the existence of the crypto-Zoroastrian groups was a late nineteenth century phenomenon, when theosophy, ilm-e khshnoom, and Iranian nationalism were all in vogue. But in the 1840's, Parsi intellectual engagement with such phenomena was still a few decades away. "I have travelled far and wide to many kingdoms, and my homeland (vatan) is "Cathay and Khotan." It is ruled by Zoroastrians. The people do not worship fire; they are by caste monotheists (khodāparast), but they recognize the fire to be the qibla and therefore have built many fire temples. The king's name is Gushtasp Bahman, and his capital is in a city called Khanbāliq (the Turkish name for Beijing). His kingdom is very large, and his sultanate is more majestic than I have ever seen even from the king of Iran. The Zoroastrians who live there are very industrious and the king possesses a large army. They have dakhmas on mountains, and they put dead people there as though it were a burial ground (avval-manzil). When someone dies, they dress him in worn out clothing. They do not eat meat. They take jizya from whatever Muslims live in that kingdom. Their language is Zand-o-Pāzand, and besides that, they speak Turkish too." What must it have been like to have been a Parsi hearing those words? Twelve hundred and ten years since the accession of the known Zoroastrian monarch, Yazdegerd III, and all of a sudden you hear of a king more splendid than even the king of Iran. Not only that, but they collect the jizya poll-tax, that same tax which had reduced their Zoroastrian brethren in Qajar Iran to poverty, from the Muslims who live in their kingdom. My, how the tables had turned. In nineteenth century Bombay, Parsis would have been used to hearing fantastic stories of China. 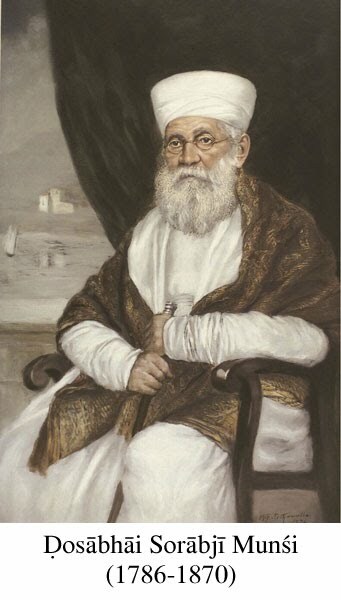 In the 1840's, Parsis still by and large consumed Indo-Persianate literature, and popular Persian romances continued to be published in Gujarati translation through much of the 20th century. In Persian literature, like in the Medieval West, China was connected to all things fantastic and amazing. Legends of Khatā-o-Khotan, Chīn-o-Māchīn, intertwined with stories of Alexander the Great, Khizr, Gog and Magog (Yaʼjūj & Maʼjūj), fantastic kings, and fairy princesses, had entranced and entertained Persian audiences for many generations. Stories of a Zoroastrian monarch in Khānbāliq (the Turkic name for Beijing) are strongly reminiscent of the Medieval Christian Prester John legend, the powerful Christian monarch ruling in the land of the infidels, near Earthly Paradise, memorably captured in Umberto Eco's Baudolino. Yet the sayyed's description also confirms what Parsis believed about themselves in the 19th century – the Zoroastrians of Cathay and Khotan are monotheists. For Zoroastrian theologians since medieval times, proving that Zoroastrians were khudāparast or yektāparast – monotheist – despite what appeared to be dualism in ancient scriptures and other sources, was to be a key occupation. In the 1840's, the term khodāparast had a unique resonance with Bombay Parsis since it is exactly what the British missionaries, led by the Rev. John Wilson, claimed that they weren't. Beginning in 1831, Parsis had been under constant attack in the missionary press for falsely claiming monotheistic belief. The Bombay Tract Society, under the control of the Scottish Missionaries, published a book a few years later in 1851 entitled Pārsio Khodāparast Che ke Nahīṃ (Are the Parsis Monotheists or Aren't they? ), in which it was alleged that was alleged that Parsis were angel-worshippers, sky-worshippers, sun-worshippers, moon-worshippers, star-worshippers, light-worshippers, air-worshippers, world-worshippers, sea-worshippers, spring-worshippers, fire-worshippers, plant-worshippers, Zarathustra-worshippers, Fravashi-worshippers, Gatha-worshippers, Geh-worshippers, worshippers of the Mazdayasnian Dīn, animal worshippers, etc. – everything except for khodāparast "monotheists" (the original text appears to the left – note the threatening use of boldface). So for the Zoroastrians of Cathay and Khotan to be real *monotheists* was in a sense a vindication of the Parsi self-identification. In the name of God. The petition is as follows: From the Iranian Zoroastrians who currently reside in the ports of Hindustan, who are presenting this petition in service to (you), Lord of the World, who are the King of Kings, whose origin is from Gayomard and Tehmuras, who wisdom is like Hoshang's, whose throne is like Jamshed's, religious like Goshtasp and equitable like Noshervan. At this auspicious time, a good man named Haji Sayyid Husayn, inhabitant of Cathay and Khanbaliq has come to Bombay, and after discussing his journey, he has informed us that in Khotan and the city of Khanbaliq, there is a king who is as glorious as Jamshed Padshah and who celebrates Jashans, Navroz, Mehergan, and the Gahambars like the people who keep the kusti tied (i.e., Zoroastrians), and who after praising God praises the Fareshtas, the stars, the Atashbehram, and Aban Ardvisur, and who puts corpses in the dakhma. Having heard this wonderful news, we sent thousands upon thousands of thanks to God the Pure and were delighted. After King Yazdegerd's kingship left him, the Iranian Parsis were harassed and scattered by the Arab armies, and only a few, having paid the Jizya, remained in their own land. A greater part of Parsis left their native land and came to dwell in Hindustan, and many years have passed since obtaining the kings' sanctuary. Nowadays, India is ruled by the British, and under their shelter, we pass our lives happily, peacefully, and comfortably. It has now been 1210 years, and up until that time, we did not know that in Cathay and Khotan there was a King of the Kayanian people who was established and prosperous. We – namely all the dasturs, mobeds, herbeds, the keepers of the Mazdayasnian religion – hope from the King of the World that you can send two great dasturs and religious mobeds with the 21 nasks in Zand and Pazand, along with an explanation of the Dasatir, the Jamaspnama, a Pahlavi dictionary, and any other books – it would be a great kindness. And whatever year, month, days, weeks, jashans, and Navroz that you observe, please describe it in writing, because amongst the Iranian Zoroastrians and the Indian Parsis, there is a one month discrepancy. Also, as for the aforementioned books, we do have some of them, but some of them are correct and others are deficient. If by your grace such a favor could be done, then you would again renew the Zoroastrian Religion to a state of paradise, and God, the Ameshaspands, and Zarathustra would be happy. For as long as the revolving heavens are in place, may your crown and throne be illuminated! Roj 2 Amardad Mah Irani / Roj 2 Tir Mah Hindustani, year 1210 AY. After paying Sayyed Husayn 1000 rupees (no small amount in 1840, enough to buy two chests of opium) to carry the letter back to the Kingdom of Cathay and Khotan, he disappeared and was never heard from again. Even before giving him the money, many Parsis suspected a hoax, like Navrozji Fardunji, who had been to Kābul and was suspicious of the Sayyid's vague answers to his questions about Central Asian roads. Yet, cruel as the hoax was, Munśi's letter is nonetheless a remarkable document, something of a religious "wishlist" of a small Indian community seeking connections to the authority of a greater, more ancient imagined (or in this case, imaginary) community in order to help solve contemporary controversies and to finally help resolve the communal sense of loss that had endured since the incursions of Alexander the Great and later the Islamic conquest of Iran. And so, the next time you hear someone tell you about the hordes of Zoroastrians in Central Asia which will somehow revitalize the community, think of the Zoroastrian Kingdom of Cathay and Khotan.